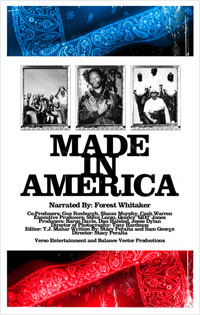 "Made in America," an operatic history of the Crips-Bloods feud, generates heat at Sundance. Plus: Palahniuk's "Choke" makes much of Jesus' foreskin. PARK CITY, Utah -- We're into the homestretch here at Sundance, with the mountains bathed in that Western combination of brilliant sunshine and crippling cold, the kind of cold that freezes car-door locks, not to mention any iPhones or BlackBerrys left outside for more than 10 minutes. After numerous ritual proclamations of sobriety and abstinence, the buyers are now rushing to spend money like a bunch of drunks running from the 12-step meeting to last call. "Hamlet 2," a high-school showbiz comedy starring Steve Coogan as a drama teacher who stages a musical sequel to Shakespeare's greatest tragedy, became the focus of the first and perhaps only bidding frenzy at Sundance this year and went to NBC Universal's Focus Features for $10 million, a near-record price for this festival. ("Little Miss Sunshine" cost $10.5 million two years ago.) I haven't seen the film (although word of mouth has been outstanding), but that's a shitload of front-end money for what sounds like a mash-up of various indie-comedy themes. Needless to say, the underwhelming acquisition news was not Topic A at Sundance on Tuesday night. I was never more than an interested spectator of Heath Ledger's career, and never met him, but the news that someone so young with such evident promise had died so needlessly cast a pall over our snowbound paradise. It took "Brokeback Mountain" and, even more so, the little-seen Australian indie "Candy" to convince me that Ledger was more than a charmer or a pretty boy, but in those roles the energy and intensity of his performances seemed electric. There was always something of Marlon Brando or Steve McQueen about him -- the charismatic screen presence, walking the tightrope between actor and movie star -- and now he's suspended forever in the middle of that continuum. On the topic of life and death, surely one of the most important documentaries at this festival is "Made in America," an operatic history and prehistory of the Crips-Bloods gang war of South Los Angeles, made by "Dogtown and Z-Boys" director Stacy Peralta. It's a film that will challenge audiences on many levels, from its horrifying newsreel footage of the bloodshed that has claimed an estimated 15,000 lives over three decades to its numerous interviews with current and former gang members and its complicated lessons on the racial history and geography of L.A.
Peralta builds a case that the long-running gang war and all its associated pathologies resulted from a perfect storm of toxic ingredients: restrictive real-estate covenants, the notorious paramilitary racism of the LAPD, the rapid deindustrialization of Los Angeles in the decades after World War II and the implosion of the African-American family. Some of that may sound like old-school, blame-society white liberalism, but the film is far more complicated than that. Virtually all of Peralta's interviewees agree that poor black communities suffer from prodigious self-hatred -- why else would so many young men embark on careers of pointless, suicidal violence? -- and that the problem must be healed from within, more than without (although spending so many billions of taxpayer dollars on the world's most punitive program of incarceration rather than, say, education really isn't helping). As Peralta told me during a fascinating interview on Tuesday (see the video here), his central intention is to humanize these young men, so often regarded as members of some predatory, not-quite-human species. "These are American teenagers, and we need to treat them that way," he said. "If 28 percent of the white male population were in prison, I kind of think we'd be doing something about it." As a group of men who appear in the film told me during a remarkable interview, coming to Sundance was a startling experience. (Again, video is on the way.) They'd been put up for free in lovely quarters, fed luxurious meals and loaded up with some of the sponsors' famous gift bags, and good for them. But more than that, they said, they suddenly found themselves in a context where they were accepted as individuals, not as members of an alien and frightening population. "It wasn't like this two days ago in L.A.," one guy said in wonderment, "and it won't be like this when we get home." A source close to Peralta's film says a distribution deal is imminent, with Time Warner's Picturehouse, Sony Pictures Classics, Miramax and the Weinstein Co. all in the running. "Made in America" may need some trimming and tidying before it's ready to face the public, but it's a shocking, absorbing and absolutely necessary film. To ask the brutally obvious question: What in Jesus Christ's name are we doing fighting a war halfway around the world, and allowing one to rage virtually unchecked in our second-biggest city? One film that will not be acquired by anybody at Sundance -- I'll just crawl out on a limb with this one -- is "Downloading Nancy," from Swedish TV-commercial director Johan Renck. It stars Maria Bello as a woman who flees her twitchy, golf-zombie husband (Rufus Sewell) for a guy she's met on the Internet (Jason Patric). They share similar tastes: Specifically, she wants him to kill her, and he says he wants to oblige. The film was shot by legendary cinematographer Christopher Doyle (Wong Kar-wai's frequent collaborator) in various shades of cadaver-dishwater gray and blue. Bello's skin-peeling, ultra-depresso performance is wrenching and brave, calling for both emotional and physical nakedness. Can a film with those attributes also be insulting garbage? It's a difficult aesthetic-philosophical conundrum, but having sat through this damn thing I now have an answer.